Facial ageing is associated with a gradual thinning of the skin and loss of elasticity over time accompanied by diminishment of dermal collagen, hyaluronic acid and elastin. 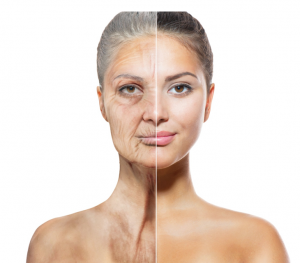 This intrinsic ageing process is accelerated and compounded by sun damage and other extrinsic factors such as smoking, resulting in facial lines and wrinkles. Habitual muscle contraction with facial expression also contributes to the formation of wrinkles, particularly in the upper third of the face. These dynamic wrinkles are typically treated with botulinum toxin injections. In the lower 2 thirds of the face, volume loss and laxity are more evident and dermal fillers are most commonly used in this region. Lines and wrinkles in this area are typically visible when the face is at rest, which are referred to as static lines. Facial volume loss, also referred to as biometric reduction, results from resorption of facial bones, degradation of subcutaneous tissue and the descent of fat pads. Facial contours change with age from high cheeks and a small chin to a bottom heavy appearance with flattened cheeks and prominent jowls. Botulinum toxin injections and hyaluronic acid fillers are used to counteract then signs of ageing.